Breakfast isn’t my most consistent meal of the day. It’s not that I don’t like eating in the morning, but I often find myself keeping strange hours that result in my first meal of the day being closer to midday. This anomaly of time-keeping results in me missing out on some more traditional breakfast foods. Today I decided it was time to break with this (lack of) tradition. I wanted a bowl of cereal and milk. 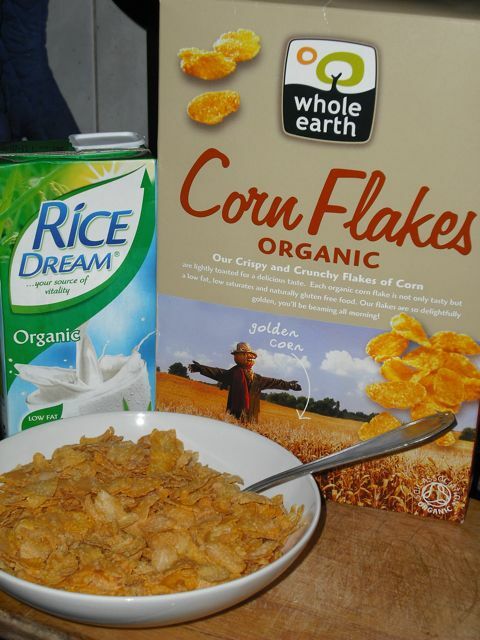 I settled for corn flakes by Whole Earth Foods, a carbon neutral company located here in the UK. These organic, vegan morsels were deliciously-crisp and perfectly complimented by some chilled Rice Dream milk. Maybe I should stop skipping breakfast and make this a regular event.